This is important because more than two-fifths (44 per cent) of the global workforce intend to leave their employers within five years. It’s a much bigger issue in India, where 58 per cent of employees acknowledge their intent to exit their present organisations within five years. The two main HR mechanisms that help businesses reduce employee turnover rates are employee satisfaction and engagement. The former covers everything you can provide in terms of remuneration, perks, bonuses, etc. However, most Indian business leaders who don’t have the luxury of offering huge pay packets and incentives to their employees are trying to improve retention rates through engagement. 70 percent of workers are not engaged at work. Companies with engaged employees earn 2.5x more revenue than companies with low engagement levels. Only 12 percent of employees leave their company because of money. Instead, company culture is the primary culprit for turnover. One of the goals of this required engagement is to keep employees highly motivated and passionate about their work, and invested in the success of your business. So that brings us to the core issue – How do I consistently motivate my employees to “go that extra mile” for the organization? How do I get employees to give their 110%? Although motivation is highly personalised, having a sound framework to understand the psychological processes involved in motivation will be a great help to you as a business leader. Frederick Herzberg, a clinical psychologist and a leading pioneer in job enrichment, is regarded as one of the great original thinkers in management and motivational theory. His theory posits that employees are only truly motivated when you enable them to reach for and satisfy the factors that Herzberg identified as real motivators, which represent a far deeper level of meaning and fulfillment. For example, if an employee continues to put in discretionary effort to produce exceptional results, but that effort isn’t recognized, then don’t expect it to keep happening. It’s not just important to recognize great work, but also how you do it. An annual bonus at the end of the year isn’t likely to do the trick. However, publicly acknowledging valuable contributions by specific team members will make that employee go the extra mile for you, and will motivate others to do the same. Theory of goal-setting and task motivation has become an integral part of the employee management process. Locke found that people are productive when motivated by clear goals and appropriate feedback. How difficult, specific and realistic a goal is affects a person’s performance and perseverance in meeting the goal. Clear and easily measurable stretch goals will improve both employee productivity and self-confidence. Develop an action plan to meet the goals using the SMART model. This is an acronym for specific, measurable, achievable, relevant and time-based. It was created by management consultants Kenneth Blanchard and Spencer Johnson. Specify the how, where and what of the goal. Include concrete before and after measures. The goal must be challenging but achievable. A stretch goal requires the employee to go beyond their comfort level and increase the level or quality of their normal performance, but it should not be impossible for them to achieve. It must be relevant to their work and the goals or strategic initiatives of the department and organization, as well as achievable within a set time frame. Regular feedback is the key. Make sure that the employee has the equipment, supplies and time she needs to achieve the goal. Follow up regularly to monitor her progress, answer questions, and give direction, coaching and support. Meet with the employee at the end of the specified time frame to review the action plan, explain changes if any and report on results. Schedule meetings with no purpose other than opening up lines of communication, to give your employees the sense that you care about their opinions and take their input seriously. Always keep your door open to questions, concerns and opinions, and make employees feel free and unafraid to discuss all these with you. Ask employees if you can help them with anything. Check in on them after delivering messages or instructions, to make sure that they were understood. Remember to show that you care about their concerns, and show your interest in addressing these concerns. Offer solutions to the issues that frustrate your employees. Empathising with your employees is the key to motivating them. Also, offering a timeline for when their frustrations or concerns will be solved keeps the relationship positive. According to a study performed by the Business Executive Academy in Germany, (Akademie für Führungskräfte der Wirtschaft), a majority of employees consider their boss to be a poor listener. Don’t just go through the flow of emotions, but listen attentively. Be completely engaged with your conversation partner. Without fail, good listeners also ask good questions. Ask for more information if you have a doubt. Repeat what you understood in your own words, but keep it brief. In your role as the boss, you must have the ability to absorb unpleasant matters or criticism without having to justify yourself on the spot. Learn to appreciate pauses, and resist the urge to say something when a pause occurs. Speak less – and speak less about yourself. Make your counterpart the focus of the conversation, regardless of whether this is customer, colleague or an employee. The most effective leaders are those who have time to listen not just to their team member’s words, but also to the priceless hidden meaning that was left untold. Understand that sometimes your employees just need someone to talk to. Communicate to them that you are always waiting to hear them out with open ears. But Branson recently revealed in an interview that Virgin does not put the customer first. In fact, Virgin employees are the company’s top priority. That may sound counter to business wisdom, but it has worked so well for Virgin that Branson says he’s surprised more companies haven’t adopted an employee-centric management strategy. No organization is better than the people who run it. The fact is that you are in the people business – the business of hiring, training, and managing people to deliver the product or service you provide. If the people who work for you are the engine of your success, then they are the ones who need to be your top priority. Attend to their needs, and keep them happy, engaged and motivated. They will take care of everything else for you. Dave Kerpen, CEO, Likeable Local (@davekerpen), says two very important things in this Inc.com piece. 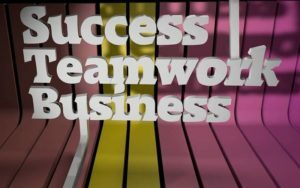 A) The difference between success and failure is a great team; and B) Your success as an entrepreneur depends on your ability to build and inspire a team. One proven way to build a cohesive and smoothly functioning team is to conduct regular team building exercises. This is a customised exercise that should be designed for your specific business needs and team member profiles. Need help with team building exercises? Evoma has training rooms and facilities for corporate events, conferences and training sessions. We are just a call away. Book now to conduct a team building event or have a team appreciation party.